I intended to post on Friday. I intended to post on Saturday. Maybe Sunday? I was hoping. Nope. It's Monday night and I am just finally able to sit down and put a blog entry together. What can I say? I've been really busy with the "creative" end of things. Sometimes it is just hard to find the time to take photos, edit photos, write ... and all the other things that go into putting together a blog post. That said, I really am sorry I wasn't able to get something together sooner. 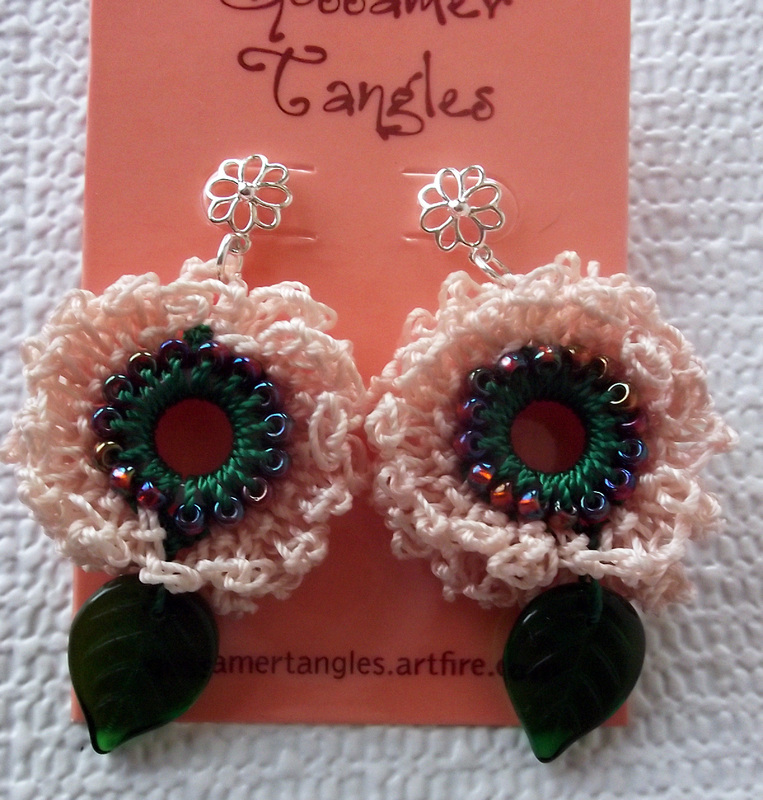 These are a variation on the crocheted spring flower earrings I shared a pattern for in my post of March 29, 2013. 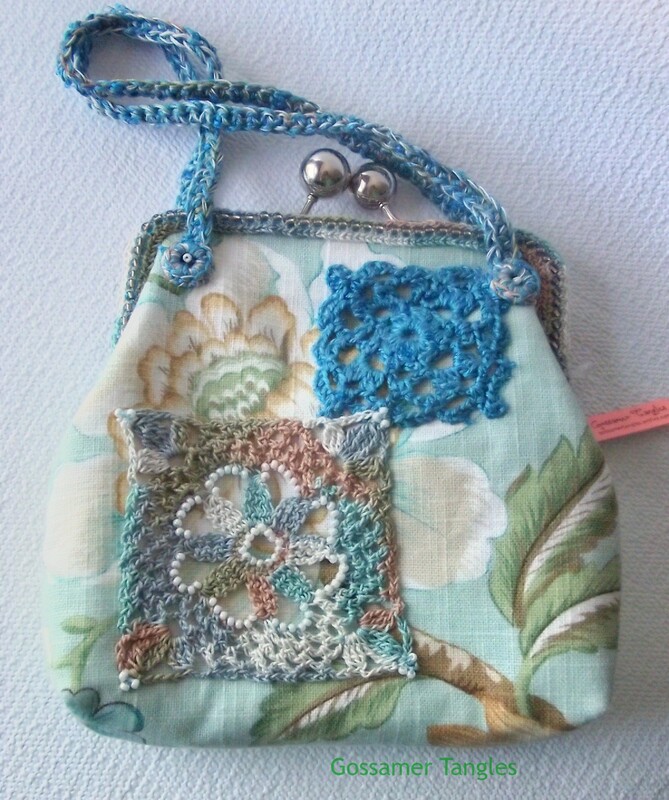 Some of you may have seen photos of this kiss clasp clutch in an earlier blog post. Can you tell what has changed since the earlier photos were taken? 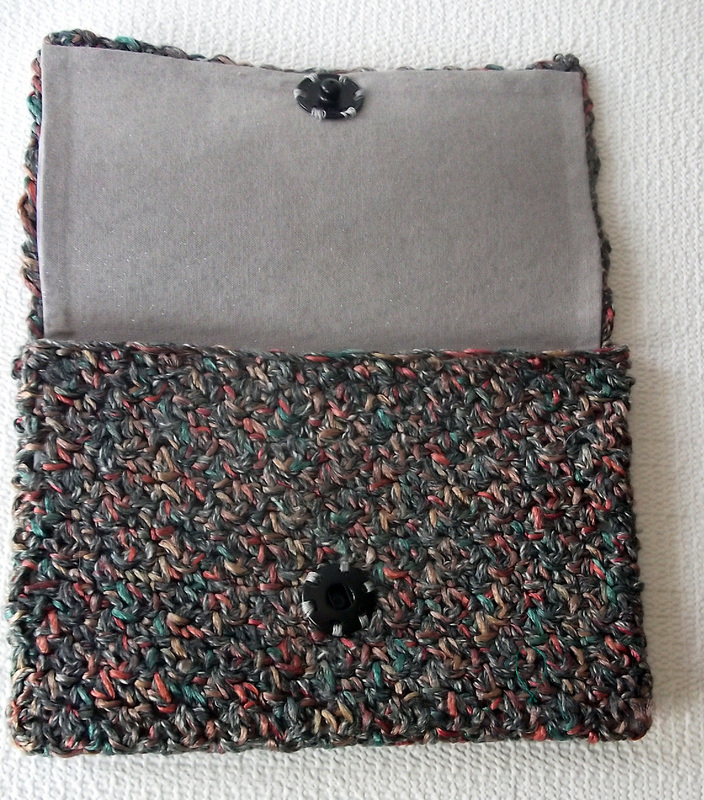 I hadn't listed it yet in my online shops because I just felt that it did not work well as a clutch. It was unwieldy to carry. It needed handles. 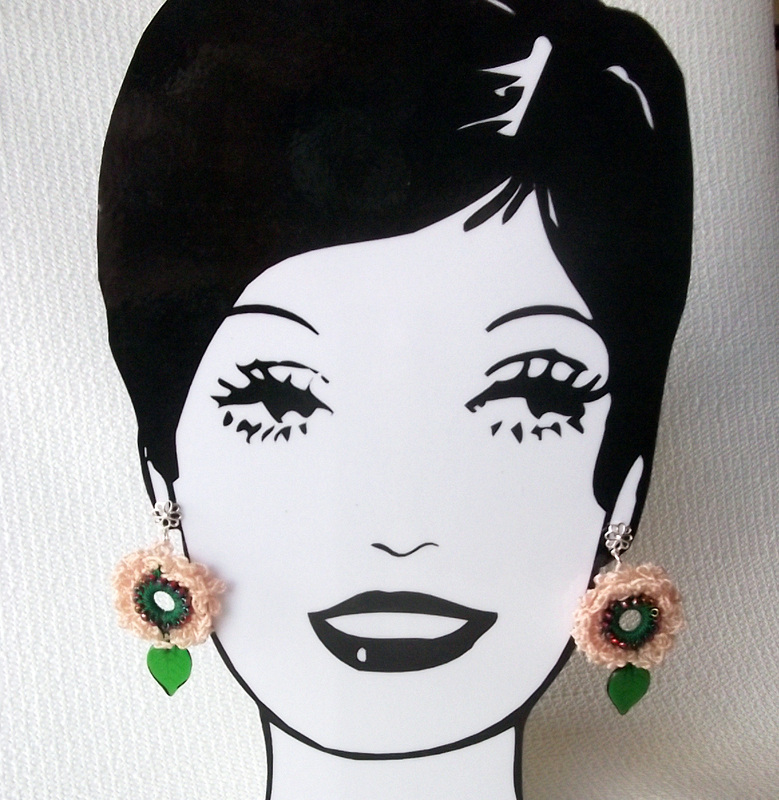 I've now added them and I think it is a much more practical design. Plus, I like the way it looks. 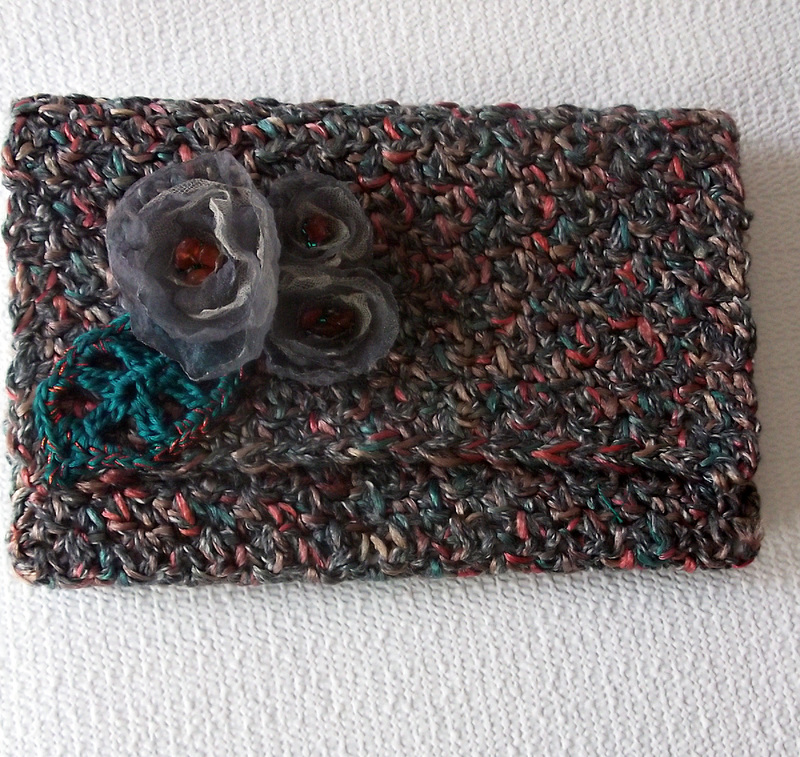 I also finished my gray/multicolor crocheted clutch with the fabric flower embellishments. I used a heavy interfacing/fabric stabilizer to give it body. It really holds its shape well. 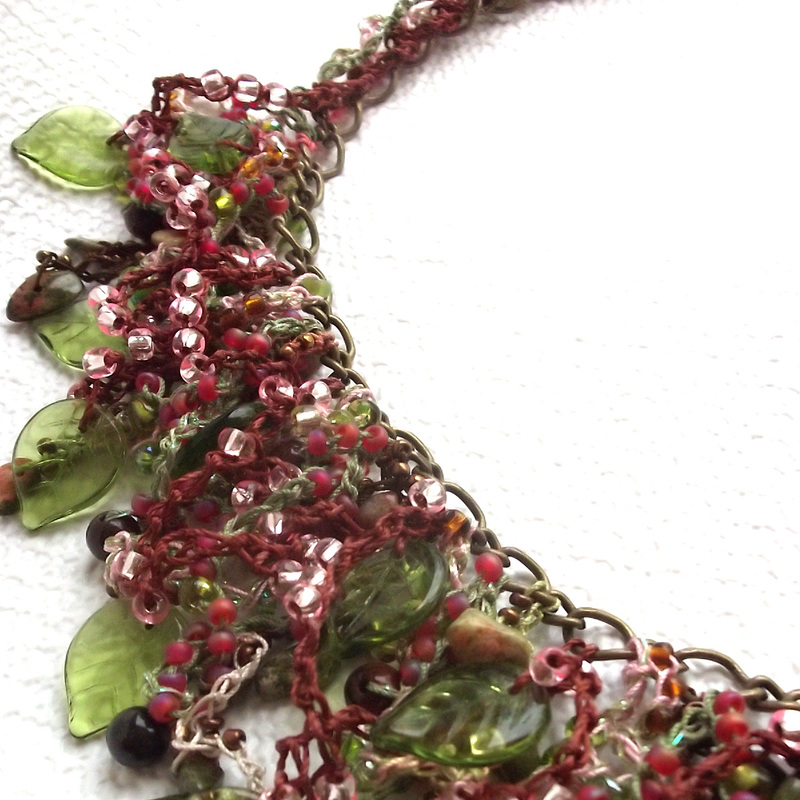 I also finished a new version of my Chain Reaction Necklace. 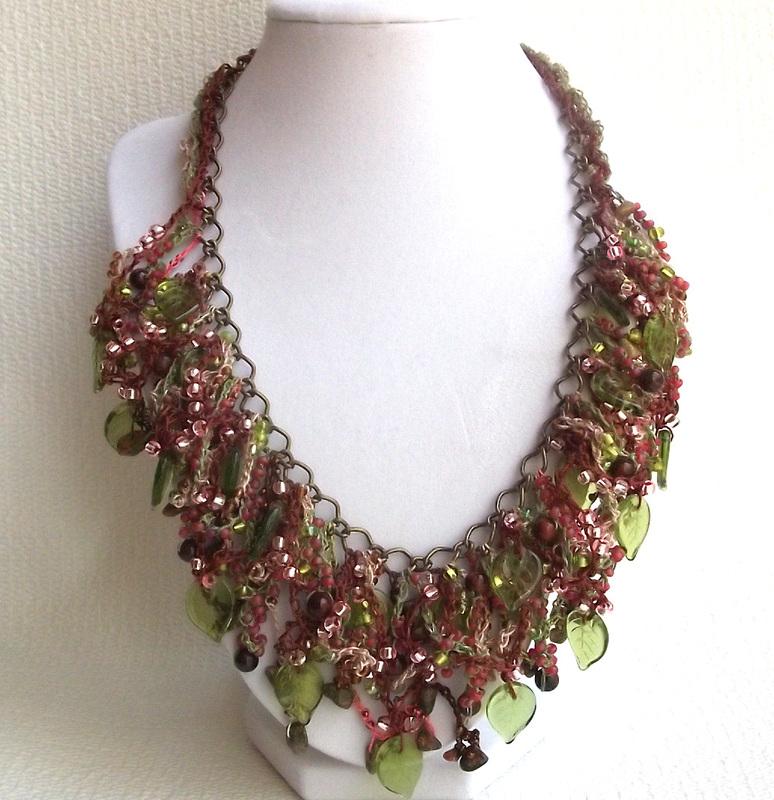 This one is done in pinks, greens, and browns. Directions for how to make this type of necklace were in my post of April 14, 2013. One of the main reasons I didn't post over the weekend is that I was finishing up Mother's Day gifts. Unfortunately, I finished them just in the nick of time and didn't even have the opportunity to photograph them. 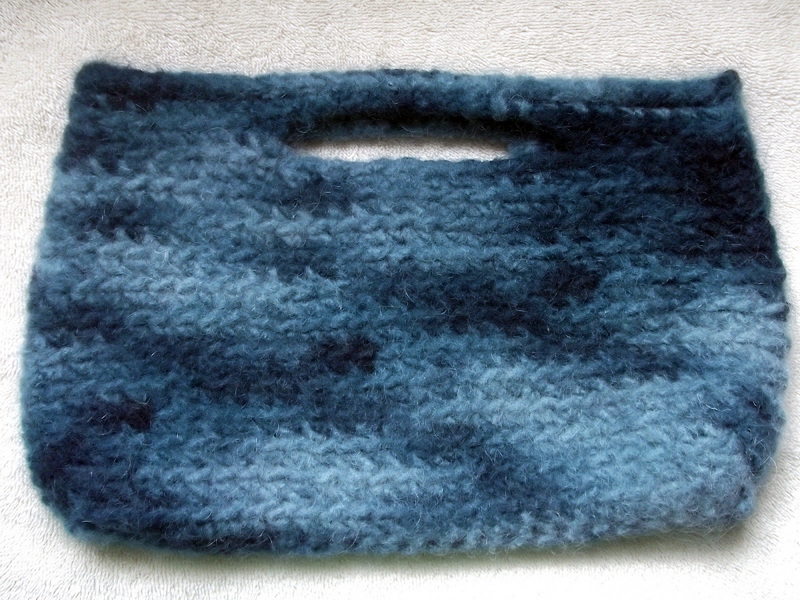 I do have a photo of the felted clutch that I made for my mom, but it only shows the body of the purse. 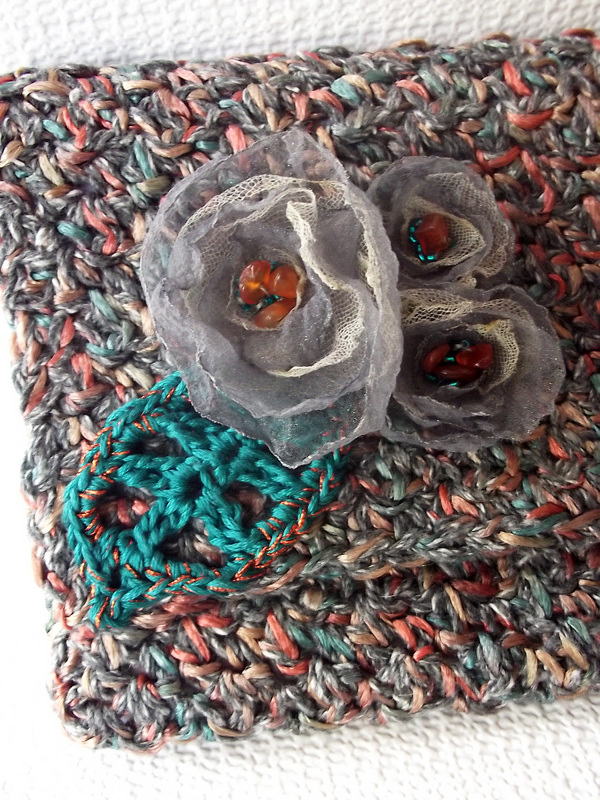 This was before I lined it or added the crocheted flower embellishment. 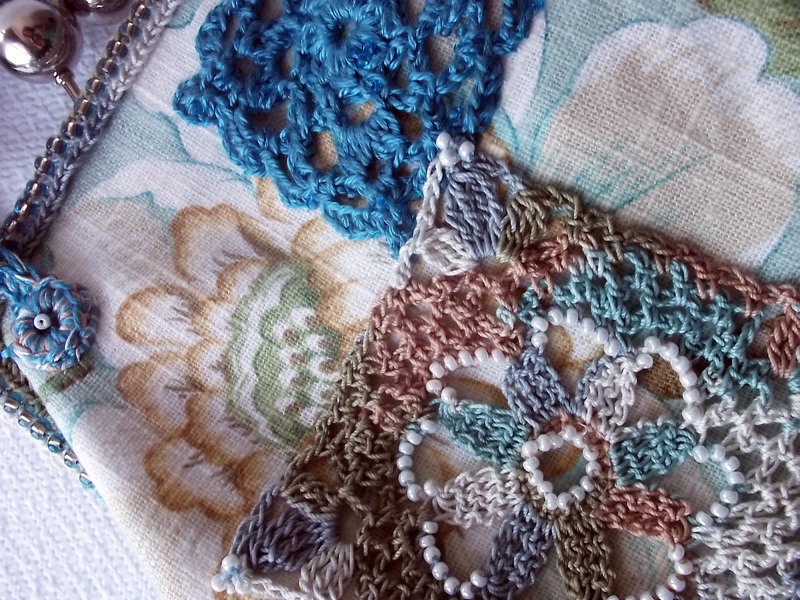 I also made crocheted flower brooches for my son-in-law's mother and his two grandmas. 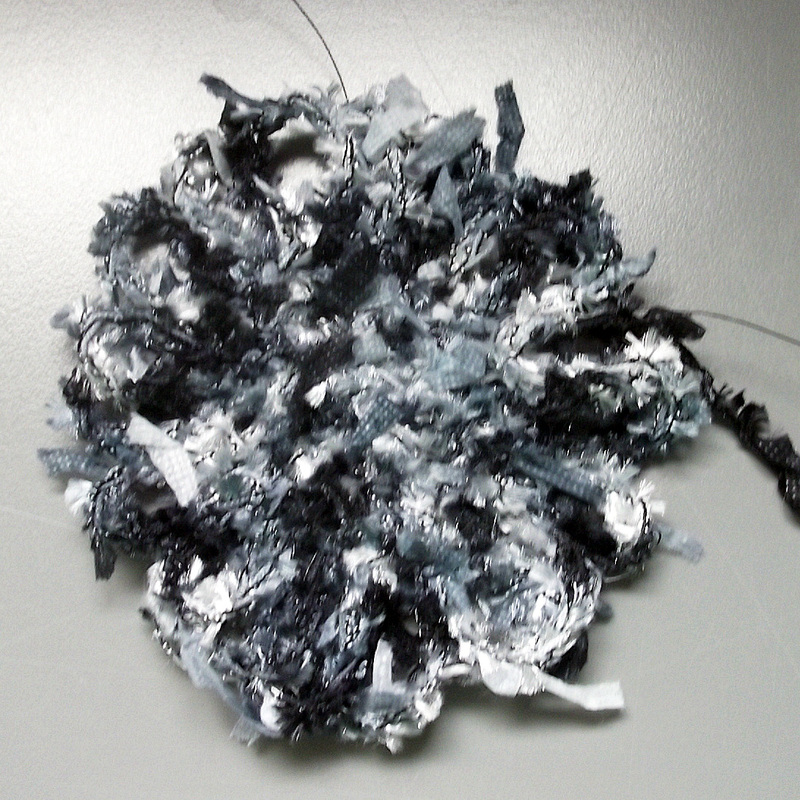 Here is a photo of a black, gray and white flower pin in progress. I decided I wanted more "springy" looking flowers, so ended up doing theirs in colors like yellow, aqua, and magenta. I used a fancy button to serve as the center in each flower. 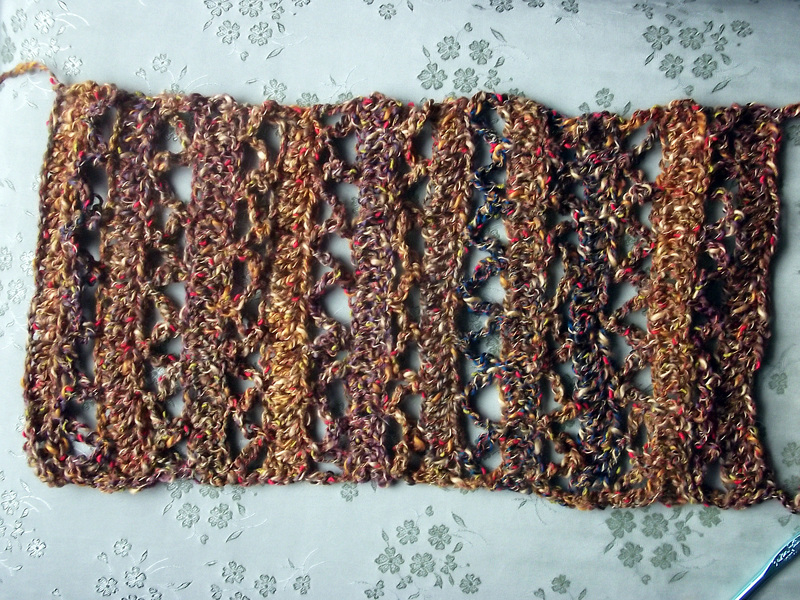 I have also been working on this crocheted scarf. I call it my "Aztec Scarf". It's been an interesting design to work with -- both in terms of creating a pattern that would give me the look I wanted and in the way the rows are worked. 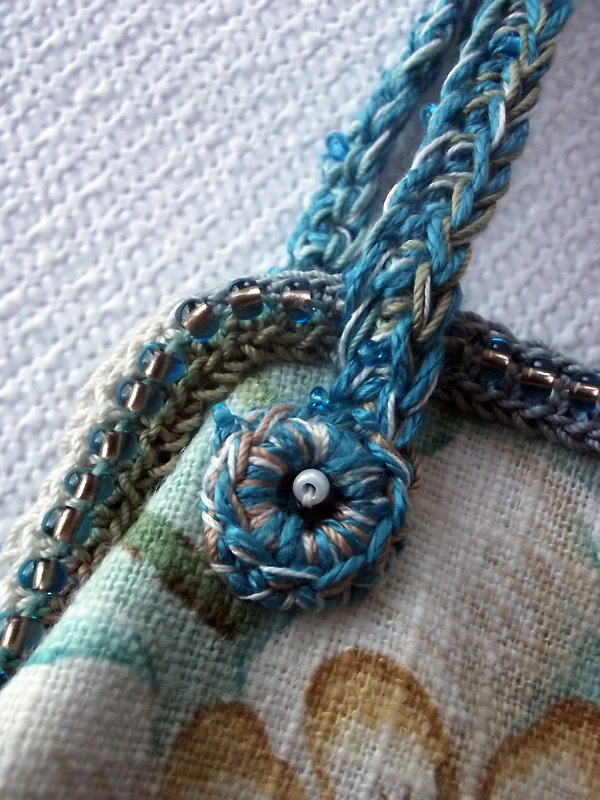 I stitch a two rows and then have to go back and fill in a row. 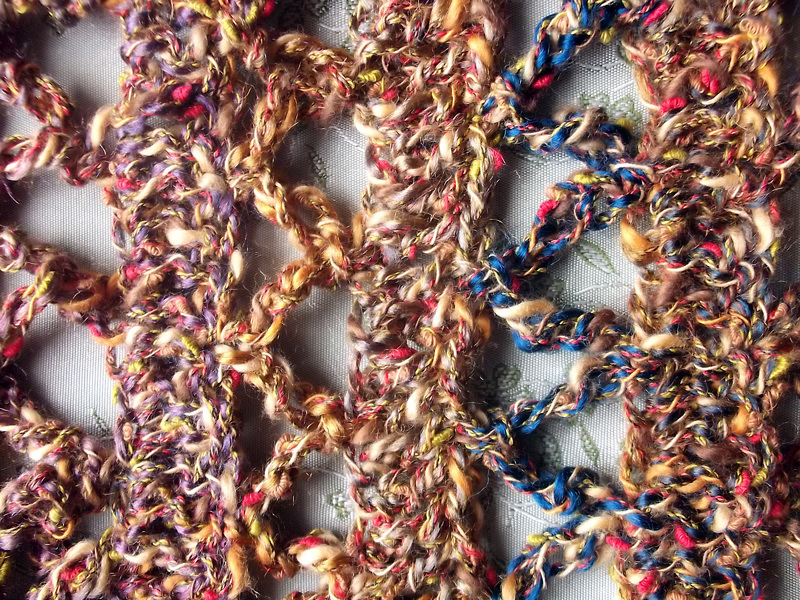 I love the texture and color of the yarn! I also did a "photo shoot", using my daughter, Betsy, as my model. She was very generous with her time! 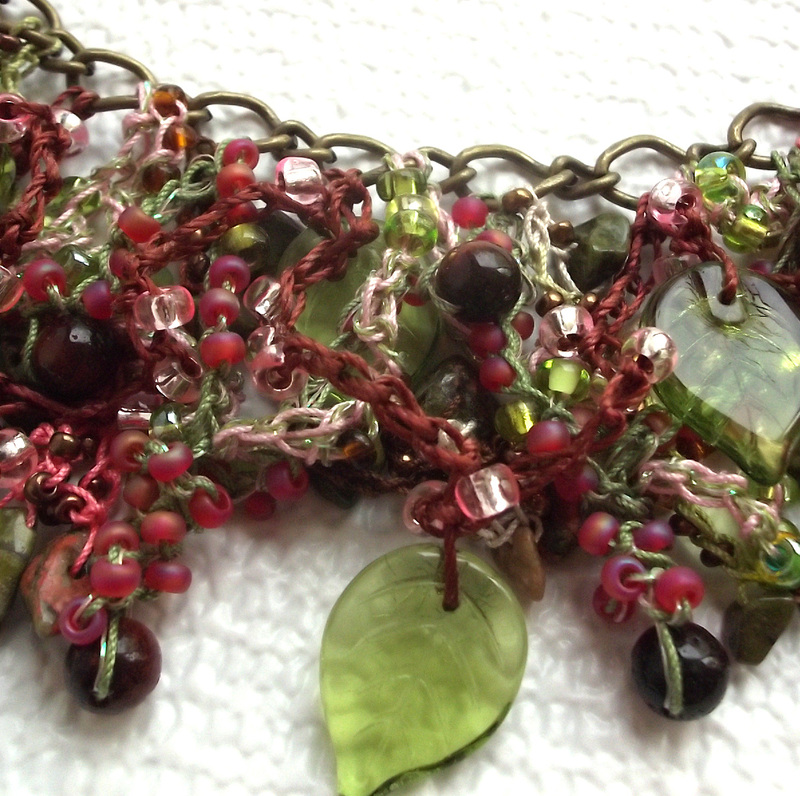 I wanted to get some photos of my creations, especially the scarves and hair ornaments, being worn by a live person. It gives a much better perspective of size and how they can be worn. I've only added a couple of the new photos to my online store listings, but hope to have time to add more of them over the next few weeks. 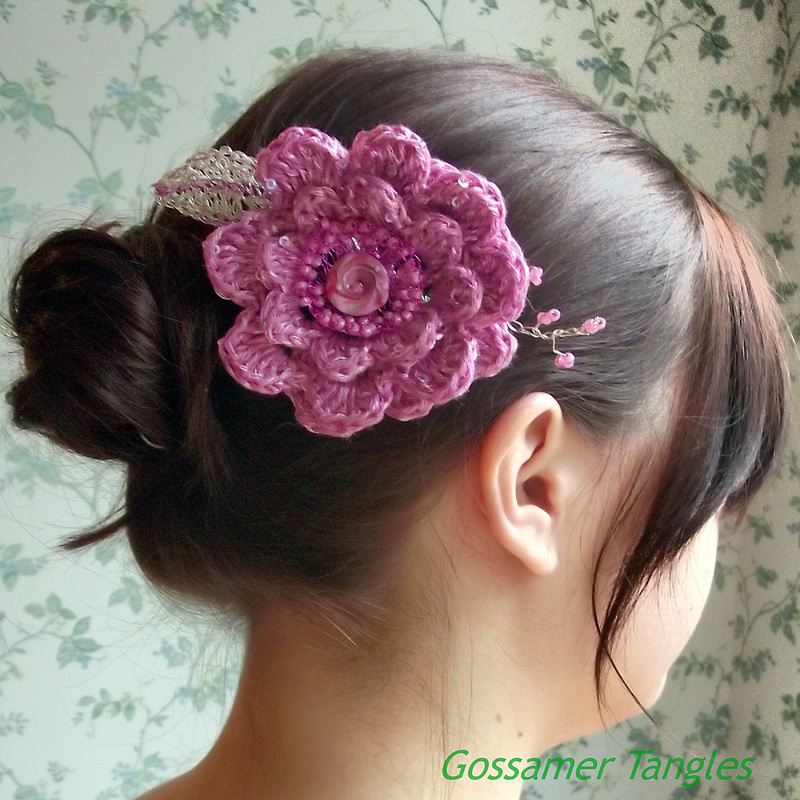 Here is a photo of her wearing my Crocheted Wire, Fiber, Sequin, Bead Pink and Silver Floral Hair Comb. The final thing that's kept me very engaged from Friday through today is helping my son, Tony Saylor, get his newest Viper Girl series book formatted and submitted for printing. It's always a tedious process, but this book is particularly image heavy and I needed to be creative in trying to get the pictures and text laid out in a way that worked with the page size. It was liking putting a puzzle together. The book is titled Viper Girl Kicks Canadian Robottom and it should be coming out within the next week or so on Amazon and Barnes & Noble. It will also be for sale at the Berkley Art Bash on June 8. Emily Zelasko did the artwork and it is amazing! 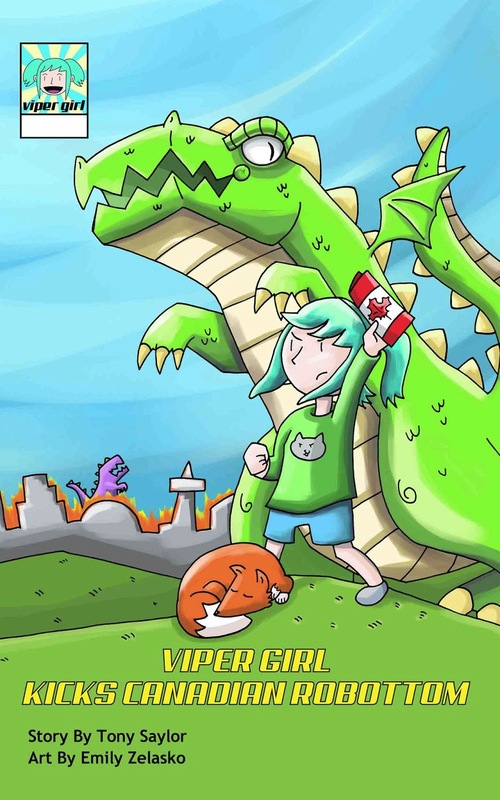 She is a wonderful children's illustrator, and her drawings really brought Tony's action-packed story to life! So, that's what I've been up to. What's creative endeavors (large, small, real, imaginary) are keeping you occupied these days?